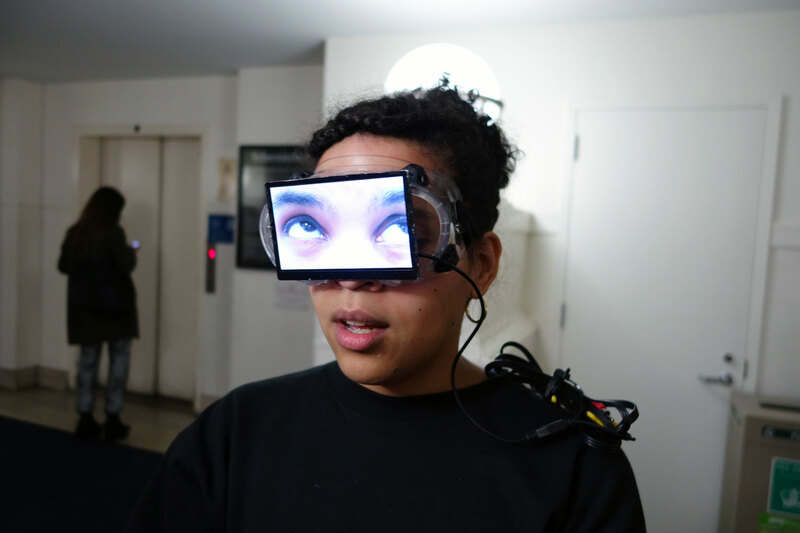 Artist Sondra Perry is the first video artist to win the Gwendolyn Knight and Jacob Lawrence Prize! Using a wide range of digital platforms and tools including 3-D avatars, blue screens, Chroma keys, and computer graphics software, Perry’s installations and performances draw from an eclectic mix of inspiration. She is focused on how a lens can turn a subject into an object. See Perry’s immersive and unique (bring your hard hat!) installation, Eclogue for [in]HABITABILITY from December 8, 2017 through July 1, 2018 at SAM. 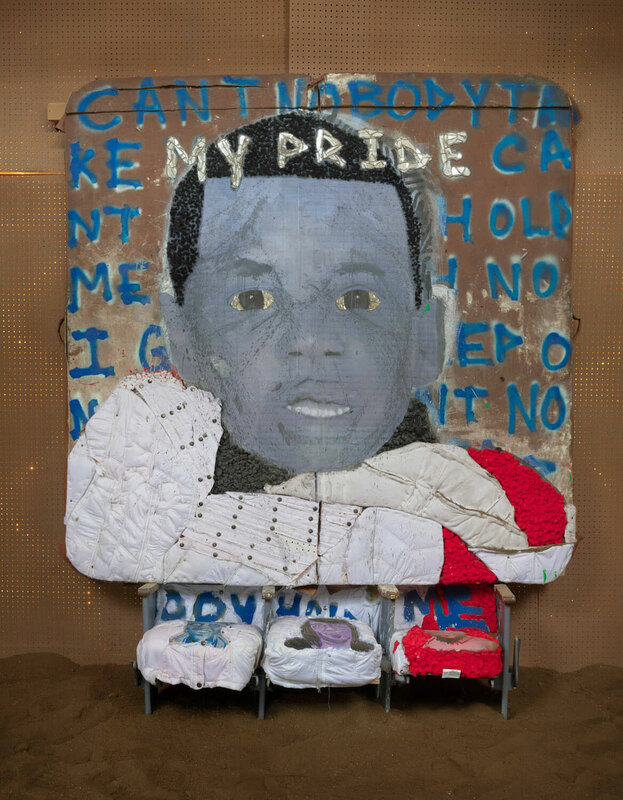 Below, Perry discusses how the internet, technology, and her personal history factor into her investigations into representations of black identity. This is taken from a talk she gave to SAM staff this February. She opened the talk with a tutorial video from YouTube on how to play an Isley Brothers song on guitar, so we will too! The interesting thing about this clip is that he’s talking about that soaring note at the beginning of the song. That’s an E Flat played backwards. In the sidebar, all of these people who have also done tutorials for this song reference this video for showing them how to play that note. This is a piece of internet archaeology that touches on my interest in the parallel; two things happening at the same time in this YouTube space. The original and the improvised other. And also, like he’s amazing. He reminds me of my uncle who played guitar for lots of different people. I spend a lot of my time on YouTube. Tons, probably too much. Not too long ago, when there were many black people dying, being murdered at the hands of police. I found this YouTube channel that was not connected to any news agency that does 3-D renderings of space travel, biology, and crimes. One of their 3-D renderings was the slaying of Michael Brown in Ferguson. I am interested in the rendering of the body, of this man in a 3-D render space. I’m interested in circulation and how these images are represented outside of the video of someone being killed. That’s not what I’m interested in at all. I’m interested in how those things are able to happen. When I was younger I read the Superman books. In the Superman Universe, the Phantom Zone is a parallel dimension that acts as a prison, an ethical one. Superman’s father, Kal-El, was the Security Minister on Krypton before it blew up, of course. He created this parallel dimension that was the Phantom Zone where you could send people to be rehabilitated. In the Phantom Zone you could see what was happening in your dimension, but you couldn’t interact with it. I’ve taken this Phantom Zone, spinning, 1980’s special effect to visualize some notions of double consciousness. I’m also playing with how a video can act as a space where there are multiple perspectives. So, you’re not just looking directly at an image—there are other things happening. I’m trying to encompass all these things into one really vibey piece of art. I’m interested in video and its production spaces. In 2016 at The Kitchen in New York I created an installation, Resident Evil. The back is a Flesh Wall—an animation of my skin with the contrast boosted. I do this through programs used to make 3-D renderings of things. The ocean modifier I used for this is supposed to help you make a realistic 3-D rendered ocean. This installation is where I transitioned from using the Chroma key green to the blue screen. The Chroma key is a video, film, and photo production technique that allows you to separate the foreground of an image and a background. So usually these images have a person in the foreground and in post-production you’re able to take that out and replace whatever kind of background you want in there. The blue screen became interesting to me because it’s the technique you would use when you’re trying to replace a background with something that’s dark because of its relationship to the end of the spectrum. I like this idea of this blue space that is simultaneously a black space that is my grandmother’s house, a park at night, or the Avengers destroying Manhattan. I like the collapse of all of those things and that’s why I decided to start covering as much of the physical spaces I was putting these videos into in this color, that is also a space. It’s also a proposition to myself and the viewership because it is a space of production. In thinking of these colors as spaces, they are not complete. I’m trying to propose that maybe we’re the ones who figure out what’s happening there. It’s a space of contemplation. Have you seen Coming to America? This movie is really funny, but there’s also a lot happening in it. You have two American men making a film about a fictional African country and there’s the contrast of Black folks from the states and Black folks from the continent. I was thinking about this family of upwardly mobile Black people who make a fortune on selling other Black folks things that change their visage in order to assimilate. There’s something complex about what it takes to be an upper-class, upwardly mobile Black person. Maybe you have to shapeshift. In that shapeshifting, there is this kind of grotesque thing that happens. They left a mark of themselves, like on this couch. I’d wanted to make this couch for a really long time and I finally did. The bike is a workstation that comes with a desk. They’re sold to people that work at home and want to maintain their physical health while they’re working. I’ve been thinking a lot about these efficiency machines that do that capitalism thing. They fix a problem that is kind of inherent in these issues of overwork. People shouldn’t work as much as they do, but rather than change, we make objects like this is bike machine. I made an avatar of myself that kind of serves as the Operating System and it talks about being efficient, efficiency, what that does for you. I don’t primarily work in video, but when I do I like working on a multi-monitor workstation because it’s a lot easier; you have your preview monitor and you have a monitor where you can edit. This set up is just a way to produce video that I wanted to mimic in the installation. Across all of this my interest is in the possibilities of blackness related to my body and also blackness as an idea of expansion, of radicalism. These things open themselves up to me through the technologies I use and through the media I gravitate towards. The issue I find with representation is that we assume that all we have to do is figure out the right way to look and we will know what something is or know what someone is. I think that’s an impossibility. Awarded bi-annually since 2009, the Gwendolyn Knight and Jacob Lawrence prize grants an early career black artist who has been producing work for less than 10 years with a $10,000 award, along with a solo show at SAM. Images: Young Women Sitting and Standing and Talking and Stuff (No, No, No), April 21, 2015, Sondra Perry, performance at the Miriam & Ira D. Wallach Art Gallery in NYC with performers Joiri Minaya, Victoria Udondian, and Ilana Harris-Babou. 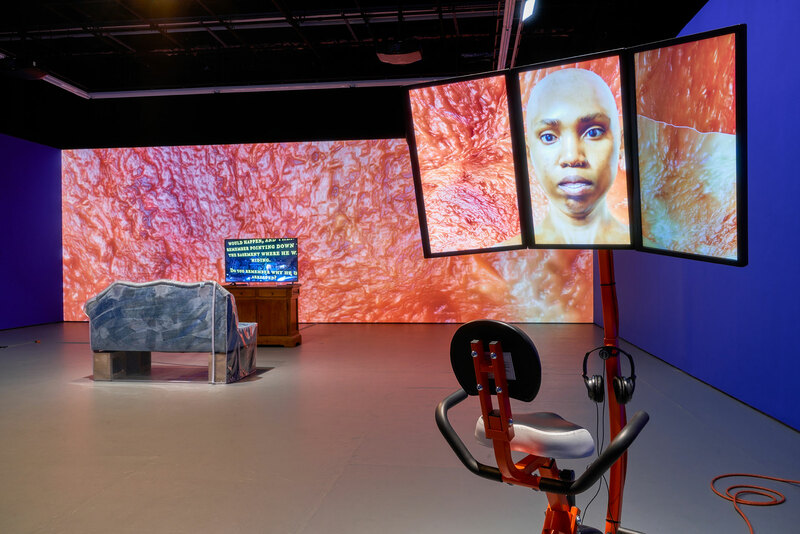 Installation view of Resident Evil (Graft and Ash for a Three Monitor Workstation in foreground) at The Kitchen, 2016, Sondra Perry, Photo: Jason Mandella.